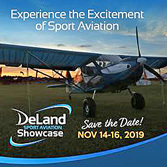 At last fall’s inaugural DeLand Showcase event, I got a chance to fly Legend Cub on their own Legend Floats. I’ve interviewed Legend folks about this model, but flying one was still on my to-do list. American Legend Aircraft Company was one of the very first in the Light-Sport Aircraft business and they’ve now fleshed out their product line of pretty yellow taildraggers… though, of course, they don’t have to be painted yellow even if almost everyone orders them this way. I guess it’s a vintage look thing, but I’m here to tell you these Cubalikes are nothing like your granddad’s Piper Cub (thank goodness, as Legend has made many desirable improvements). One of the biggest changes is the wide variety of engines this company has offered. 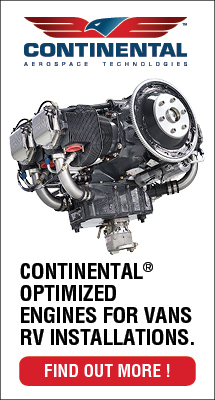 They started with the Continental Motors‘ venerable 100-horsepower O-200, added the 120-horsepower Jabiru 3300 six cylinder model, then tapped the 115-horsepower Lycoming O-233, and now Legend offers the mighty 180-horsepower Titan, offered these days by Continental following their acquisition of ECi of Texas. In my years as a hang glider pilot — and for many friends who enjoy unpowered paragliders — the idea of what's called a "top landing" is something of the holy grail. Such a feat can now be rather commonly achieved, especially by a slower flying paraglider, but is nonetheless quite thrilling to launch from a mountain and then land back on top of that mountain. This avoids the need to breakdown, drive back up, and set up for another launch but mainly it is just a terribly cool thing to do. Still, landing a hang glider or paraglider back on top of the mountain is reasonably straightforward compared to landing an airplane atop a moving truck. Sure, you may have seen it done at airshows and perhaps you marveled at the skill involved. Yet I'm guessing that virtually no one reading this article has ever attempted the feat much less done so repeatedly ... and, by the way, at an airshow with lots of people watching and cameras recording everything. American Legend announced the successful completion and testing of a new Super Legend HP aircraft to be used in Greg Koontz Airshows' World's Smallest Airport flying routine. 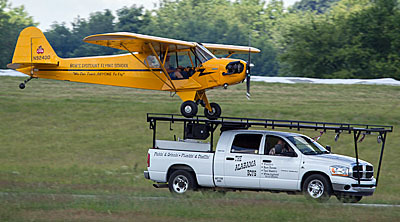 "Pilot and performer Greg Koontz concluded the tests of the Super Legend by successfully landing the aircraft on top of a moving pickup truck," reported the Sulphur Springs, Texas manufacturer. Koontz's new Super Legend HP is a stock aircraft that incorporates options specific to his airshow, American Legend said. 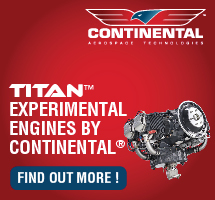 "These include a Smoking Airplanes 3.5 gallon smoke system; a larger step allows easier access to the cabin ... and a 180 horsepower Titan engine," now marketed by Continental. Don Wade of C&D Aviation worked with Koontz and American Legend on this project. He summarized Koontz' initial reactions saying, "Greg [said] the airplane flies similar to the original Piper J-3." In his previous version of this act, Koontz used the vintage model Cub. "Greg is one the most precise airshow pilots in world. You have no idea how difficult landing on the truck is. You have just six inches either side of the wheels." Greg Koontz has been performing in airshows since 1974 when he was a member of Colonel Moser's Flying Circus. Koontz credits having learned his maneuvers from retired Air Force Colonel Ernie Moser, who he said was "the best in the business." 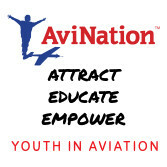 To know where he will perform the "smallest airport" bit with his powerful Legend Cub, visit his website for a complete 2016 show schedule that includes 16 stops including Sun 'n Fun and Oshkosh. Super Legend HP uses the increasingly popular Titan O-340 engine, a stroked derivative of the Lycoming O-320. The powerplant is a four cylinder, 340 cubic inch displacement engine producing 180 horsepower, similar to the larger and heavier O-360. The company said, "Super Legend HP, with the Titan O-340, offers fast cruise speeds and the best ever takeoff and climb performance in a Light-Sport Cub." The company explained that to qualify as Light-Sport Aircraft, maximum takeoff power must be limited to five minutes with continuous power derated to 80 horsepower. "Special lightweight custom paint and avionics packages are available to maintain Super Legend HP empty weight at less than 904 pounds," to gain acceptance by FAA as a fully-built LSA. Super Legend was first offered with the 115-horsepower Lycoming O-233 so the Titan-powered one perhaps ought to be called Super-Duper Legend. I look forward to see it perform at 2016 airshows. In my years as a hang glider pilot — and for many friends who enjoy unpowered paragliders — the idea of what’s called a “top landing” is something of the holy grail. Such a feat can now be rather commonly achieved, especially by a slower flying paraglider, but is nonetheless quite thrilling to launch from a mountain and then land back on top of that mountain. This avoids the need to breakdown, drive back up, and set up for another launch but mainly it is just a terribly cool thing to do. Still, landing a hang glider or paraglider back on top of the mountain is reasonably straightforward compared to landing an airplane atop a moving truck. 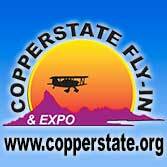 Sure, you may have seen it done at airshows and perhaps you marveled at the skill involved. Yet I’m guessing that virtually no one reading this article has ever attempted the feat much less done so repeatedly … and, by the way, at an airshow with lots of people watching and cameras recording everything. Super Duper Legend Cub with 180 Horses! Get all the details at the company's website page for Super Legend HP. Whoa, big boy! When you have huge power available, you need to ... well, go have fun! I've covered the Super Legend before (article & video), which had the multi-fuel, electronic ignition 115-horsepower Lycoming O-235 installed. Certainly that was and remains a solid powerplant but now the company has added a Titan engine that pulls like a team of stallions. Call it the Super Duper Legend Cub. As sales of Legend Cubs and similar aircraft have shown, pilot interest in Cubalikes is strong. American Legend recently logged their 10th anniversary; they've been around since the LSA sector first arrived on the scene. However, they haven't simply made the same old airplane in the same old way. Now welcome Super Legend HP. 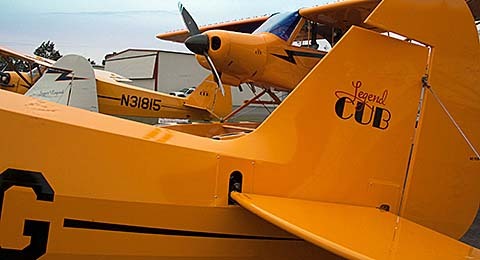 Before Sun 'n Fun 2015, the Sulphur Springs, Texas company announced they had added, "a host of new features for our Super Legend, adding functionality, comfort and safety to the lineage of Legend Cub aircraft. Standard and optionally available, these features range from advanced carbon fiber components, including the company's new carbon fiber amphibious floats, to the latest in NextGen and touchscreen electronic flight displays." Super Legend HP, the new top-of-the-line model for American Legend's stable of Cub aircraft, was introduced at the Lakeland, Florida event featuring a 180-horsepower Titan O-340 engine. Get this: Super Legend HP can leave the ground in a mere 35 feet and climb at 2,000 feet per minute, according to American Legend. The HP model can clear a 50-foot obstacle in 200 feet, said the company adding, "The Titan O-340 offers fast cruise speeds of up to 104 mph TAS at 2150 rpm." 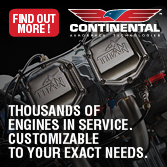 "The four-cylinder, 340-cc Titan engine is a stroked derivative of the Lycoming O-320. It weighs 245 pounds, which is 20 pounds less than the similar O-360," reported American Legend. The HP derivation is an upgrade of the Super Legend that was introduced in 2011 (when the video above was shot). With more carbon-fiber components and expanded avionics options Super Legend HP is available as an LSA, with certain restrictions to comply with the rules, or as an experimental kit airplane. To qualify as a Special LSA, Super Legend HP has a maximum takeoff power limitation of five minutes with continuous cruise operations limited to 80 horsepower. 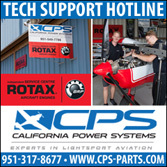 This procedure is used by other LSA that employ high-powered engines. For the SLSA model, American Legend uses a special lightweight custom paint and avionics packages to assure Super Legend HP weight stays under SLSA certification rules of 904 pounds. However, the company noted, "Super Legend's strength-tested airframe, up to 1,750 pounds." When sold as an Experimental, the same airframe may use the higher gross weight." To benefit from a higher useful load that comes with the increased gross weight, buyers will need a Medical and will build their own airplane. A very familiar supplier to the LSA community, American Legend is a leader in a crowded Cub market. 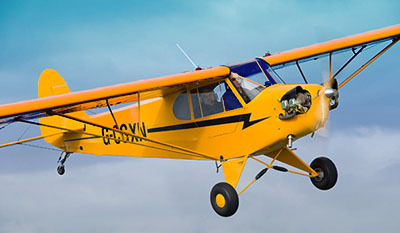 Over a decade, the Texas outfit has built well-regarded product support for its line of Legend Cub aircraft. 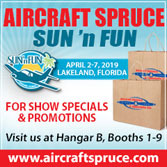 Launched as the SP/LSA rule was introduced by FAA, American Legend has firmly established itself as one of the most successful manufacturers in the space. 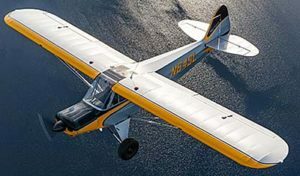 "We have built a reputation among our Legend Cub owners and operators, guest pilots, passengers, and within the industry for designing aircraft that are true to the Cub form yet are modern, competitively priced, and built to last," stated the company. In addition to being a solid player in the light aircraft industry, American Legend has developed a full line of aircraft and components. Beside the open-cowl original and offering several engine choices, you can buy Legend Cubs in ready-to-fly or kit form plus you can choose AmphibCub. While floats have been available for some time, AmphibCub has recently received the full American Legend treatment and now sports in-house-designed Legend Floats. American Legend recently completed certification of its own Kevlar and carbon fiber LF1500A amphibious float design. Purpose-built for the Super Legend, the company's amphib floats use a manual gear mechanism that also offer watertight storage compartments. Focused first on strength and performance Super Legend AmphibCub is available with a wish list of features such as the much-revered touch screen Garmin G3X display. These options are available on most Legend Cubs. Garmin's G3X brings the latest in advanced avionics to Legend Cub aircraft. 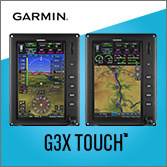 Available in 7-inch or 10.6-inch displays, G3X has been called "more advanced than modern airliners," reported American Legend. Synthetic vision, a two-axis autopilot, and fuel flow metering are just a few of the features. Keeping their vintage-appearing aircraft fully up with the times, American Legend recently installed and received approval of an ADS-B system. 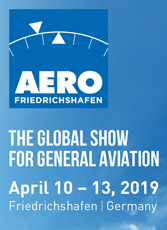 The company observed, "A far cry from early Cubs that flew without radio and transponder, the installation meets the FAA's 2020 mandatory compliance requirements for NextGen ADS-B equipage. The option includes a FreeFlight Systems Model 1201 WAAS GPS sensor and a Trig Mode S and 1090ES ADS-B Out capable transponder." Whoa, big boy! When you have huge power available, you need to … well, go have fun! I’ve covered the Super Legend before (article & video), which had the multi-fuel, electronic ignition 115-horsepower Lycoming O-235 installed. Certainly that was and remains a solid powerplant but now the company has added a Titan engine that pulls like a team of stallions. Call it the Super Duper Legend Cub. As sales of Legend Cubs and similar aircraft have shown, pilot interest in Cubalikes is strong. American Legend recently logged their 10th anniversary; they’ve been around since the LSA sector first arrived on the scene. However, they haven’t simply made the same old airplane in the same old way. Now welcome Super Legend HP. Before Sun ‘n Fun 2015, the Sulphur Springs, Texas company announced they had added, “a host of new features for our Super Legend, adding functionality, comfort and safety to the lineage of Legend Cub aircraft. 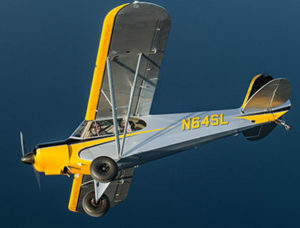 Available previously as a kit (more on that below), American Legend recently provided photos proving that the Sulfur Springs, Texas company has now won a Special LSA certificate for the Super Legend, topping our SLSA List at number 133. The model has other differences but a key reason for the name is the Lycoming O-233 engine supplying 115 horsepower that gives a nice boost to its performance on wheels or floats. Super Legend will go up against the CubCrafters Carbon Cub SS (with 180 horsepower) and the Zlin Cub-S (also 180-hp). While it may not provide the same excess of power it is more affordably priced than Carbon Cub SS, although the latter is a highly developed offering that is generous in its use of carbon fiber, as its name implies, and in an overall sense of stylized design. American Legend noted, "The closed cowl Super Legend has the same power-to-weight ratio as a 150-hp Piper Super Cub. The Lycoming O-233 delivers 115 horsepower and delivers unlimited performance in a classic Cub platform." The company reported standard equipment includes: ground adjustable composite prop, traditional white paint with red striping, adjustable seats, basic panel (altimeter, airspeed, inclinometer, tachometer, oil pressure, oil temperature, voltmeter), 406 MHz ELT, 6.00 x 6 tires. As the order form for either kit or fully built suggests you can add a wide range of options including Dynon or Garmin glass panel packages (including radios and more) for $24-26,000, TruTrak autopilot for $8,000, AmSafe airbag seat belts for $4,000, lighting packages for $4,000, or floats at $28,000 for straight floats or $38,000 for amphibious versions. Other than the floats, all these deluxe packages take the lovable Piper Cub concept into the new millennia. Options also take the price toward $200,000 yet the appeal of the design is strong with both American Legend and CubCrafters reporting good or strong sales in a otherwise sluggish LSA environment. A fully built AL18 Super Legend Cub in the look of a Super Cub lists for $146,800 and as referenced you can bid that base price up a great deal if you wish. Those who want a new Cubalike but can't swing two hundred grand could opt for the kit. The airframe components start just above $50,000 and you add the Lycoming O-233 for $25,000 plus could choose a builder assist program for $18,000. The latter can help you build in as little as 21 days American Legend specified though they indicate "Extra building days may be required depending on options." Individual aptitude and degree of motivation would also be a factor. Pre-wired instrument panel packages will add $23-25,000 but speed the kit assembly process. However you may choose to select from the taildragger offerings from American Legend, you now have more choices and it seems likely that more of this iconic shape are destined to populate the skies. Legend president Darin Hart is pleased with the company's efforts of late, passing an FAA audit this fall amid the government shutdown and now winning SLSA approval for the Super Legend. Hart noted that the new model came in with "an empty weight of 862 pounds equipped with common accessories and lighting, giving a useful load of 458 pounds." He added, "The big differences, compared to other Legend models are flaps and aerodynamic tail surfaces plus the more powerful and multi-fuel O-233 engine supplied with 30 gallons of fuel instead of the 20 gallon capacity of the other Legend models. Super Legend first flew in January of 2012. For more details, please check our video interview. Available previously as a kit (more on that below), American Legend recently provided photos proving that the Sulfur Springs, Texas company has now won a Special LSA certificate for the Super Legend, topping our SLSA List at number 133. The model has other differences but a key reason for the name is the Lycoming O-233 engine supplying 115 horsepower that gives a nice boost to its performance on wheels or floats. Super Legend will go up against the CubCrafters Carbon Cub SS (with 180 horsepower) and the Zlin Cub-S (also 180-hp). While it may not provide the same excess of power it is more affordably priced than Carbon Cub SS, although the latter is a highly developed offering that is generous in its use of carbon fiber, as its name implies, and in an overall sense of stylized design. 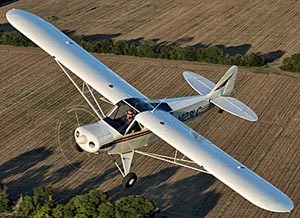 American Legend noted, “The closed cowl Super Legend has the same power-to-weight ratio as a 150-hp Piper Super Cub.